Praise to the Lord, The Almighty, the King of creation! O my soul, praise Him, For He is thy health and salvation! All ye who hear, Now to His temple draw near; Join me in glad adoration. 3 Praise to the Lord, Who o’er all things So wondrously reigneth, Shelters thee under His wings, Yea, so gently sustaineth! Hast thou not seen How thy desires e’er have been Granted in what He ordaineth? 4 Praise to the Lord, Who doth prosper thy work And defend thee; Surely His goodness and mercy Here daily attend thee. Ponder anew what the Almighty will do, If with His love He befriend thee. 5 Praise to the Lord, Who with marvelous wisdom Hath made thee, Decked thee with health, And with loving hand Guided and stayed thee. How oft in grief Hath not He brought thee relief, Spreading His wings to o’er shade thee! 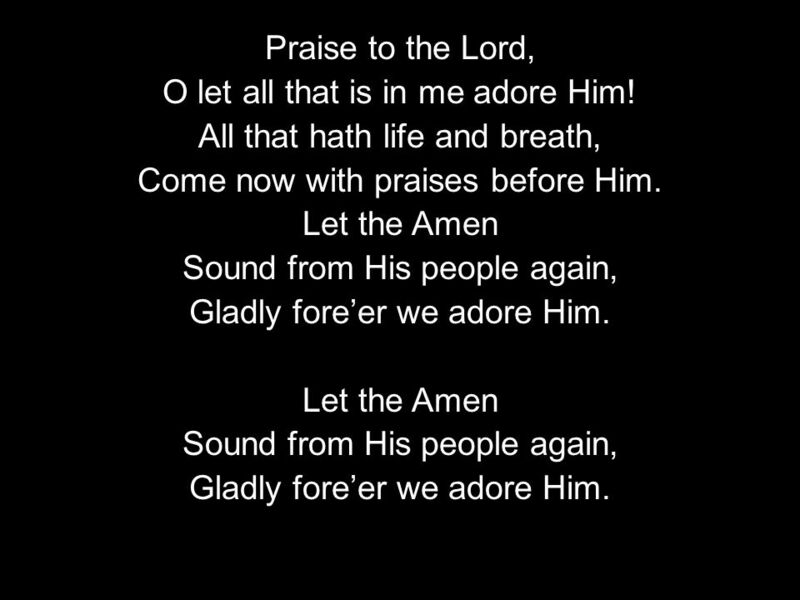 Praise to the Lord, O let all that is in me adore Him! All that hath life and breath, Come now with praises before Him. Let the Amen Sound from His people again, Gladly fore’er we adore Him. Download ppt "Praise to the Lord, the Almighty"
Praise to the Lord, the Almighty, the King of creation! O my soul, praise him, for he is thy health and salvation! All ye who hear, Brothers and sisters. Famous One You are the Lord, the famous One, The famous One Great is Your name in all the earth The heavens declare You’re glorious, glorious Great is. “Come all and tune your hearts to sing”. Come, People of the Risen King Come, people of the Risen King, Who delight to bring Him praise; Come all and. Praise to the Lord, the Almighty Praise the Lord, O my soul; all my inmost being, praise his holy name. Praise the Lord, O my soul, and forget not all. Only Your Blood is Enough I am ashamed, conceived in sin, I’ve always been. Born in a world where Adam’s fall corrupts us. FREESONGS PowerPoint (If this file is opening up from within your browser and you want to download it instead, right click (for PC’s ) or option click. Praise to the Lord Praise to the Lord, the Almighty, the King of creation! O my soul, praise Him, for He is thy health and salvation! The Prophets Speak Lesson 23 “Three Tests” Daniel 1:1-3:30. Praise to the Lord, the Almighty The King of creation O my soul, praise Him For He is thy health and salvation All ye who hear, Now to His temple draw. Hosanna Praise is rising, eyes are Turning to You, we turn to You Hope is stirring, hearts are Yearning for You, we long for You. Celebration of the Vigil Mass for the Twenty-seventh Sunday in Ordinary Time Saturday, October 4, 2014 Celebrant - Rev. Father Stefan Migac Ordained a.